Carol was 65 when she first experienced problems. I had been having aches and pains for months, but nothing specific. Just before Christmas two years ago I was struggling back to the car in the multi-storey car park with several bags of Christmas presents when my chest started to hurt. The pain shot down my left arm and I seriously thought I was having a heart attack,” she remembers. Having dropped all her shopping and being rushed to hospital, Carol created quite a stir in the local shopping centre but tests then showed that she had actually had a less serious episode of angina. “It was still a sign that something was wrong, though, and I spent the next few weeks having a series of tests to find out more about the state of my coronary arteries – it was a very worrying time,” she says. One of the tests that was arranged for Carol was a coronary angiogram to find out which of her coronary arteries was blocked, or partially blocked. “The results were rather inconclusive unfortunately; there were some shadows around my left ventricle muscle but it wasn't clear what was going on. The consultant spoke to me a week later and advised that he would like to arrange a cardiac MRI scan rather than to repeat the coronary angiogram. “I had heard of an MRI scan but thought it was something that was used to detect brain tumours – I wasn't sure how it would work to show what was happening in my heart”, says Carol. 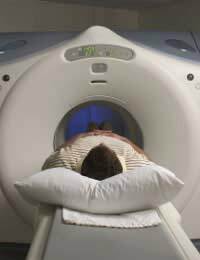 What Does a Cardiac MRI show? This was one of the first questions that Carol had for her doctors. “The consultant and a specialist in the MRI technique explained things very well – the technique uses a very strong magnetic field and this causes the atoms in all the cells of the body to line up and then spin – something like that anyway,” Carol laughs. “But the main point is that the imaging can 'see' all of the soft tissues and when a contrast dye called gadolinium is injected into one of your veins just before all the imaging is done, this really shows up all of the blood vessels that pass through the heart and into the heart muscle in great detail. Even the smallest capillaries can be seen and it is possible to find out if any of the coronary arteries have fatty plaques or abnormalities,” says Carol. On the day of the scan, Carol was told that she could eat and drink normally but she was really nervous and could only face a cup of tea before she set off for the MRI unit at the larger hospital in the next town. “I have always been claustrophobic and the thing about an MRI scan is that you need to lie still inside a sort of metal tunnel, which is the scanner. The thought horrified me and having to keep still and lie in there for maybe an hour or longer was really making me worry,” Carol admits. Sensibly, Carol got a friend to drive her to and from the hospital for her appointment and when she arrived she was obviously nervous and anxious. “I was a bit embarrassed that I was one of the 1 in 20 people who have MRI scans who need to have sedation but that really helped to calm me down – in fact, I was quite sleepy when I was inside the scanner and the time just flew by,” she remembers. Carol was not quite so calm when the results came back and she was called into the hospital again urgently the following week. “Although I did have some minor problems in one of my coronary arteries, the MRI scan showed that the root of my problems was actually one of the main heart valves, which had started to leak when it shouldn't have. I was put on the urgent list and had heart valve replacement surgery less than 6 weeks later,” explains Carol. Although she had to be out of action for a few weeks, Carol has now completed a full rehabilitation program for cardiac health and now walks about 3 miles every day. “When I was recovered enough, I went to my local dog rescue centre and rescued a dog who was 2 years old. His owners had had a baby and he was just too boisterous and they had little time to walk him. He is perfect for me though and we walk for miles – actually in a way, he has rescued me too, as I am now back to much better health,” she concludes.